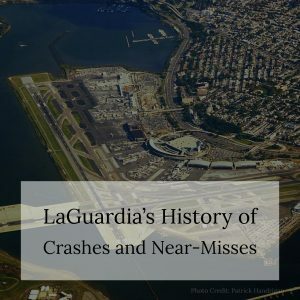 Jonathan C. Reiter Law Firm » Airport Accidents » NYC Aviation Accident Lawyer Asks: Does LaGuardia Have an Ugly History? Since 1939, LaGuardia Airport—which was known as the New York Municipal Airport when it first opened—has served as one of the busiest airports in the world. Along with JFK International and Newark Liberty International, it is part of the biggest airport system in the U.S. and the second-largest in the world with respect to passenger traffic. However, LaGuardia has seen its fair share of accidents and near-misses. Most recently, a plane skidded off the runway in late October 2016. The incident perhaps drew more attention than it might have ordinarily, as the flight happened to include Vice President-elect Mike Pence. Shortly after the incident, several news outlets referenced LaGuardia’s unfortunate history of “ugly” accidents. Fortunately, no one was hurt in the October incident, however, the plane tore up the concrete runway as it skidded into a patch of grass. The Federal Aviation Administration (FAA) credited an “Engineered Material Arresting System” as helping the plane to stop, preventing serious injuries. The system in question allows the concrete to deliberately crush apart when a plane begins skidding. A similar skidding accident occurred just last year, when a Delta flight slid off the runway on an icy day in March. In that case, about two dozen passengers were hurt. In 2013, a plane’s landing gear collapsed during landing, causing the plane to veer onto the grass, injuring 16 people on board. Perhaps most notably, the “Miracle on the Hudson” landing in 2009 occurred after the U.S. Airways flight took off from LaGuardia, striking geese that disabled both engines just minutes after lift-off. Tragically, LaGuardia has also seen several fatal aviation accidents. In 1992, problems with de-icing caused a plane to crash into Flushing Bay just after take-off. The crash resulted in 27 fatalities. In 1989, another accident during lift-off killed two passengers and caused 15 injuries after the plane ran off the end of the runway and crashed into Bowery Bay. Although LaGuardia’s runways are well within the suggested length for “small commercial aircraft,” they fall far short of the runways at JFK and Newark, which are 14,000 feet and 11,000 feet, respectively.